Saving the voices of the elders, one story at a time. Born in France in 1926, René Fumoleau came to Denendeh (Northwest Territories) as a young priest in 1953. Travel to Rádeli Kóé (Fort Good Hope) involved a long boat journey down Dehcho (the Mackenzie River) into a new world. Through all of the years, his attachment to the Dene peoples deepened. He celebrated the strength of their ancestral wisdom and committed himself to their desire for change. René published As Long as This Land Shall Last as a contribution to the struggle over land claims; directed two films, I Was Born Here and Dene Nation; he also took thousands of photos, now housed in the Prince of Wales Northern Heritage Centre in Yellowknife. 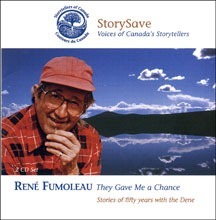 René began creating stories of his experiences in 1988, writing them first in two books of poetry, Here I Sit and The Secret, and then telling them at events and festivals across the land. Here is another link to a lengthy and interesting interview: http://www.herondance.org/Rene-Fumoleau-W145C50_webpage.aspx?